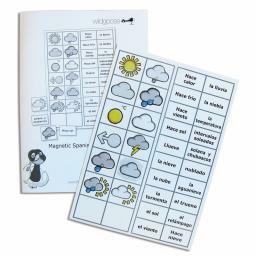 12 magnetic weather symbols and 2 blanks, plus 20 weather-related words and phrases in Spanish to match to the symbols. Use with the magnetic UK map (WG2668) or Spain map (SP0013). Translations provided.